When you talk about video game consoles the first topics are usually the quality of play and the graphics; it’s the fun factor not the technology. But beneath the surface of shiny plastic cases and glowing LED’s, these remain powerful devices with impressive technical credentials. The consoles can do a lot more than gaming and their innovations are carrying into entirely unrelated sectors. Nintendo’s motion activated controller has proven to be a huge hit with consumers. The simple, but effective interface, has completely changed the nature of video game play. It’s expanding audiences, increasing accessibility and just simply: fun. It’s also turning out to be a lot more powerful. The phrase “Wii Warfare” sounds like another upcoming title, like a competitor to Call of Duty or another shoot-em-up game. In actuality, the tag line is literal. New Scientist magazine reports that Department of Energy engineers have adapted a bomb and mine diffusing robot called Packbot so that it can be controlled by a Wii Remote. (They’re also doing it on another robot called Talon) . In tests using the original joystick controllers, engineer David Bruemmer said, “90% of the operator’s workload goes into driving the robot” instead of monitoring other sensor based feedback the machine provides. The natural motions governing the Wii Remote provide a more intuitive process that takes less intellectual overhead. An operator using a Wii remote can do more with less. The engineers have also adjusted the tactile feedback system (vibrations) used in the remote so that, like in a game, the control will vibrate or chirp when the robot encounters something the software filters identify is noteworthy. Imagine, a game controller controlling something that’s anything but a game? 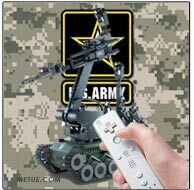 That’s the reality of Wii Warfare and the Wii Remote. The accelerometer controlled motion sensors (an iPhone could be used similarly) are giving engineers an entirely new tool kit for considering how to control automated machines. With a re-purposed Wii remote they can drive a bomb diffusing robot. They could theoretically use it to operate surgical tools. Drive remote controlled vacuum cleaners (the robot bomb diffuser is made by the same company that makers robotic vacuums). Control a remote control plane.… whatever their imagination guides them to. When Sony designed the PS3 game console, they engineered it around a new, powerful computer chip called a cell processor. The unique architecture makes distributed (or parallel) processing a part of the design. That translates to improved graphic rendering abilities. It also means the PS3 is ideally suited to handle the kinds of complex computational analysis usually reserved for supercomputing grids, or their singular siblings, super computers. Last March and April, Sony made upgrades to the firmware on the consoles to allow just that functionality to become possible. As a result, with an owner’s permission, an Internet connected console, when not in use for gaming, gained the ability to function as part of a distributed computer network (or grid). Stanford’s Folding at Home (F@H) project, a computation network doing advanced bio-chemical modeling to crack the codes of Alzheimer’s, cancer and other diseases, took note. They expanded their focus and began incorporating PS3’s into their network architecture. A third example of alternate game console uses doesn’t require them to be used in an unintended capacity but it does have a similarly unimagined intent: game play as physical therapy. Increasingly, from Senior Centers to hospitals, therapists are looking at the ways video game play can aid the rehabilitation process. Many caretakers, in fact, are finding they can incorporate the movements used with a Wii Remote and some sports games to help patients work through physical therapy. In Chicago, the Hines Veteran’s Affairs Hospital recently bought a Wii for their Spinal Injury Unit. The Army’s Walter Reed Medical Center is incorporating Wii therapy too. Playing with the Wii in a therapeutic setting seems to balance controlled physically activity with entertainment, a perfect combination for making therapy more palatable. With the Wii Fit balance board controller getting closer to its retail release date (and other motion based controllers expected too) this trend is likely to expand. All of these alternate uses, and others, are made possible by the amazing tech-specs of these new gaming platforms. The three examples provided represent just the tip of the iceberg of the consoles’ potential. These are powerful machines. The Xbox 360 and the PS3, for example, each sport chip sets running at 3.2Ghz and supporting a cast of computational resources on par with far more expensive PC’s. Curing cancers, diffusing bombs, rehabilitating the injured – the consoles are not just for gamers any more. (A more detailed side by side comparison of the tech specs for the consoles can be found here). •Video Games and Cancer Research? Guess So.